This article is about the city in Southern Russia. For the city in Yaroslav Oblast, see Rostov. Rostov-on-Don (Russian: Росто́в-на-Дону́, tr. 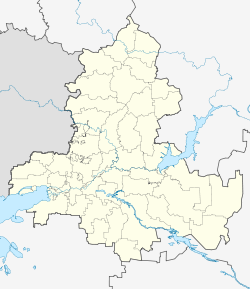 Rostov-na-Donu, IPA: [rɐˈstof nə dɐˈnu]) is a port city and the administrative centre of Rostov Oblast and the Southern Federal District of Russia. It lies in the southeastern part of the East European Plain on the Don River, 32 kilometers (20 mi) from the Sea of Azov. The southwestern suburbs of the city abut the Don River delta. The population is over one million people (1,125,000). In 1749, a custom house was established on the Temernik River, a tributary of the Don, by edict of Empress Elizabeth, the daughter of Peter the Great, in order to control trade with Turkey. It was co-located with a fortress named for Dimitry of Rostov, a metropolitan bishop of the old northern town of Rostov the Great. Azov, a town closer to the Sea of Azov on the Don, gradually lost its commercial importance in the region to the new fortress. In 1756, the "Russian commercial and trading company of Constantinople" was founded at the "merchants' settlement" (Kupecheskaya Sloboda) on the high bank of the Don. Towards the end of the eighteenth century, with the incorporation of previously Ottoman Black Sea territories into the Russian Empire, the settlement lost much of its militarily strategic importance as a frontier post. In 1796, the settlement was chartered and in 1797, it became the seat of Rostovsky Uyezd within Novorossiysk Governorate. In 1806, it was officially renamed Rostov-on-Don. During the 19th century, due to its river connections with Russia's interior, Rostov developed into a major trade centre and communications hub. A railway connection with Kharkiv was completed in 1870, with further links following in 1871 to Voronezh and in 1875 to Vladikavkaz. Concurrent with improvements in communications, heavy industry developed. Coal from the Donets Basin and iron ore from Krivoy Rog supported the establishment of an iron foundry in 1846. In 1859, the production of pumps and steam boilers began. Industrial growth was accompanied by a rapid increase in population, with 119,500 residents registered in Rostov by the end of the nineteenth century along with approximately 140 industrial businesses. The harbour was one of the largest trade hubs in southern Russia, especially for the export of wheat, timber, and iron ore. In 1779, Rostov-on-Don became associated with a settlement of Armenian refugees from the Crimea at Nakhichevan-on-Don. The two settlements were separated by a field of wheat. In 1928, the two towns were merged. The former town border lies beneath the Teatralnaya Square of central Rostov-on-Don. By 1928, following the incorporation of the hitherto neighbouring city of Nakhichevan-on-Don, Rostov had become the third largest city in Russia. In the early 20th century, epidemics of cholera during the summer months were not uncommon. During the Russian Civil War, the Whites and the Reds contested Rostov-on-Don, then the most heavily industrialized city of South Russia. By 1928, the regional government had moved from the old Cossack capital of Novocherkassk to Rostov-on-Don. In the Soviet years, the Bolsheviks demolished two of Rostov-on-Don's principal landmarks: St. Alexander Nevsky Cathedral (1908) and St. George Cathedral (1783–1807). During World War II, German forces occupied Rostov-on-Don, at first for ten days from November 21, 1941 to November 29, 1941 after attacks by the German First Panzer Army in the Battle of Rostov and then for seven months from July 23, 1942 to February 14, 1943. The town was of strategic importance as a railway junction and a river port accessing the Caucasus, a region rich in oil and minerals. It took ten years to restore the city from the damage during World War II. On August 11 and 12, 1942 in Rostov-on-Don 27,000 Jews were massacred by the German military at a site called Zmievskaya Balka. In 2018, Rostov-on-Don hosted several matches of the FIFA World Cup. The 2010 census recorded the population of Rostov-on-Don at 1,089,261 making it the tenth most populous city in Russia. There were sultry days of brassy sun, but also cool evenings on the balconies facing the Don River, with the soft glow of charcoal in the samovar, with the ripe cherries crushed by your spoon against the bottom and sides of your glass of scalding tea. Rostov-on-Don lies in a humid continental climate (Köppen: Dfa). The winter is moderately cold, with an average February temperature of −3.1 °C (26.4 °F). The lowest recorded temperature of −31.9 °C (−25.4 °F) occurred in January 1940. Summers are hot and humid; July temperatures average +23.3 °C (73.9 °F). The city's highest recorded temperature of +40.1 °C (104.2 °F) was reported on 1 August 2010. The mean annual precipitation is 643 millimeters (25.3 in), the average wind speed is 2.7 m/s, and the average air humidity is 72%. In December 1996, Rostov-on-Don adopted a coat of arms, a flag and a mayoral decoration as the symbols of the town. The first coat of arms of Rostov-on-Don was designed in 1811 and approved by the Tsar. In 1904, some changes were made. One lasting oil painting of the coat-of-arms is kept in the regional local history museum but its accuracy and authenticity is uncertain. In June 1996, the Rostov-on-Don City Duma adopted a variant of the coat-of-arms in which a tower represents the St. Dimitry Rostovsky Fortress. The ancient Russian arms reference the role Rostov played in the defense of Russia's borders. The coat-of-arms adorns the mayor's decoration but all other cases of its use are first considered for approval by the City Duma. The flag of Rostov-on-Don was approved by the Duma on September 20, 1864. At the end of the 19th and beginning of the 20th centuries the home guard regiments, which defended the Southern borders of Russia, were raised under this flag. The "Flag of Rostov" is kept in the town's municipal building under glass. Its length is 1,370 millimeters (54 in) and width, 850 millimeters (33 in). The flag is taken out of the building only on Victory Day and Rostov-on-Don Day by a guard of honor. In 1870, an oval shape mayoral decoration wrought from precious or semi-precious white metal was introduced. On the front is written "Rostov-on-Don" at the top, the Rostov-on-Don coat-of-arms is in the center and the inscription, "Mayor of the City" is written at the bottom. On its reverse side, the day of its adoption, April 9, 1996, is recorded. The decoration is worn over the suit on a large chain. The mayor returns the decoration to the Duma on his or her retirement from office. The Emblem of the Don Host Oblast was introduced in July 5 (18), 1878. The flag of the All Great Don Army was introduce in May 1918 on the "Circle of the Don Saving". Rostov's favourable geographical position at trading crossroads promotes economic development. The Don River is a major shipping lane connecting southwestern Russia with the north. Rostov-on-Don is a trading port for Russian, Italian, Greek and Turkish merchants selling, for example, wool, wheat and oil. It is also an important river port for passengers. The Rostov-on-Don agricultural region produces one-third of Russia's vegetable oil from sunflowers. In modern times, Rostov-on-Don has experienced economic growth. Numerous start-up companies have established headquarters in the city, the median income is increasing, and the city is being transformed into a modern, industrial and technology-rich hub. For instance, Rostov-on-Don is a center for helicopter and farm machinery manufacturing. The "Tebodin" engineering company opened its fourth office in Rostov-on-Don in June 2010. Public transport in Rostov-on-Don includes buses, trolleybuses, trams, and marshrutkas (routed cabs). The Rostov Metro is under development. The Rostov-on-Don Airport caters for domestic travel, as well as flights to and from the former C.I.S., Europe, Africa and Asia. Its IATA code is "ROV". Donavia airlines (formerly "Aeroflot Don") has its head office in Rostov-on-Don. The Bataysk military aerodrome (which is located 5.0 miles (8.0 km) northwest of the city center) may be developed into a new airport hub for Southern Russia. [needs update] Platov International Airport was opened in late 2017 as part of preparations for the 2018 FIFA World Cup. The international river port specializes in the packaging and freighting of minerals and timber. Shipping information is published on line. The main railway stations in Rostov-on-Don are "Rostov-Glavny" and "Rostov-Prigorodny". The "St. Petersburg-Rostov-Caucasus" railway crosses the territory of Rostov-on-Don. The North Caucasus Railway offices are in Rostov-on-Don. Several highways of federal and regional significance cross Rostov. The M-4 “Don” route passes Rostov to the east and crosses the Don river in the Aksay city area. The “Rostov-Novoshakhtinsk” starts from the Northern housing block area of the city running north to connect with the M-4 “Don” route between Shakhty and Novoshakhtinsk. The Ministry of Regional Development of Russia has prepared a program to create eight multimillion conglomerate population centres or 'super cities'. The Rostov Oblast will be one of these. “The Greater Rostov” metropolitan area will include the cities of Rostov-on-Don, Novocherkassk, Taganrog, Aksay, Bataysk and Azov. In 1929, the first automatic telephone exchange in Russia with a capacity of 6,000 numbers commenced in Rostov-on-Don. Since 2004, standard telephone numbers in Rostov-on-Don have been seven digits in length. Since 2009, city numbers have begun with "2" The city dialing code is "863". Rostov-on-Don hosts higher educational establishments, including universities, academies, secondary schools of vocational training including colleges, technical schools, specialized schools, and elementary schools of vocational training including lyceums, professional colleges and schools of general education. Rostov College of Arts named after M.B. Grekov. There is also a French cultural centre (Alliance Francaise), a British Council and German Goethe Institute (DAAD and Bosch foundation), and a Korean Cultural Centre. The most conspicuous architectural feature of the central part of the city is the Cathedral of Virgin's Nativity (1860–1887), designed by Konstantin Thon. South-Russian Don State Public Library. In the Academic Drama Theater named after Maxim Gorky works Mikhail Bushnov, who is the national artist of the USSR and an honorary citizen of Rostov-on-Don. The small collections of the Art Gallery and the Museum of Arts include some works by Repin, Surikov, Perov, Levitan, Aivazovsky as well as of modern Rostov artists. Other facilities include seven stadiums, a Palace of Sports, a circus, a zoo botanical gardens and parks. Rostov-on-Don hosts the North Caucasian Science Center and research institutes. The city is also home to a Starbucks coffee chain, a true rarity in this geographical area of Russia. The Administration of Rostov and Novocherkassk Eparchy of the Russian Orthodox Church is located in Rostov. Other religious facilities in Rostov-on-Don are the Roman Catholic "Church of the Lord's Supper", the Old Believers' temple, a synagogue, a mosque, and the Diamond Way Buddhist Center of the Karma Kagyu Tradition. There are also several Armenian and Greek Orthodox churches in the city, with one of the Armenian churches being the oldest standing building in Rostov. All of the Armenian churches are in the Nakhichevan-on-Don district of the city. The construction of the Rostov TV centre began in 1956 and was completed on 26 April 1958. The first television program was broadcast on 30 April 1958. Colour television was first broadcast in 1974. Radio transmission began in Rostov-on-Don on October 17, 1975. In 2009, there were fourteen FM radio stations in Rostov-on-Don. Rostov-on-Don is one of the host cities for the 2018 FIFA World Cup. In 2018, Rostov-on-Don was one of the Russian cities to host the 2018 FIFA World Cup. Rostov Arena with a capacity of 45,000 spectators was built on the left bank of the Don River, left of the exit from the city via the Voroshilovsky Bridge. The stadium will host 5 games of the FIFA World Cup. During the FIFA World Cup, the Teatralnaya Square will serve as a venue for the FIFA Fan Fest. The specially arranged area will have a capacity of 25,000 people. Fans will be able to watch all World Cup games on a big screen. The venue will be serviced by food outlets and have several entertainment areas. In preparation for the FIFA World Cup, the city has implemented a large-scale development program. Apart from the new stadium, the city has built a camping area for fans arriving for the World Cup, the Southern and Western Bypasses, and new hotels. Reconstruction works have been carried out at the bridge crossing over the Don River (expanding the traffic way to 6 lanes), a number of healthcare facilities, and the embankment area. A new airport, Yuzhny, has been built. Notable people include Olga Spessivtseva ballet dancer, Alexander Suvorov military commander, Yelena Produnova artistic gymnast, Yulia Belokobylskaya artistic gymnast, Andrei Chikatilo (1936–1994) serial killer, and Alexander Pechersky (1909–1990) a leader of the rebellion at the Sobibor extermination camp, and Maria Kharenkova artistic gymnast. Authors of Rostov-on-Don include Anton Chekhov, Mikhail Sholokhov, Zakrutkin, Fadeyev, Safronov, Kalinin, Alexander Pushkin, Maxim Gorky, Sergey Yesenin, Shushanik Kurghinian, Aleksey Nikolayevich Tolstoy, Alexander Solzhenitsyn, Yuri Zhdanov and Mikael Nalbandian. After visiting Rostov in 1831, Pushkin published his poem "The Don". The monument to Pushkin on Pushkin Boulevard is dedicated to these events. Maxim Gorky, worked as a docker in Rostov-on-Don in his youth. Vera Panova (1905–1973) was a Soviet era writer. Modern era includes such names as Danil Korezky and Tony Vilgotsky. A monument to Aleksandr Solzhenitsyn, who lived in the city for 18 years and studied mathematics at Rostov University, is being planned by city authorities. A monument to Anton Chekhov (see Chekhov Monument in Rostov-on-Don) was erected in 2010. Musicians from Rostov-on-Don include Efrem Zimbalist the violinist, Zaslavsky, Kim Nazaretov, Modest Mussorgsky, composer Andrey Pashchenko (1885-1972) , the pop music singer Irina Allegrova (1952), Yuri Bashmet, Sergey Vladimirovich Rodionov, Eva Rivas (1987), Mikhail Puntov (1995), the post-punk rock band Motorama and the rap band Kasta. Actors and playwrights of Rostov-on-Don include Maretskaya, Mikhail Shchepkin, Yevgeniya Glushenko, Alexander Kaidanovsky (1946–1995), Evgeny Shvarts (1896–1958), Nikolai Sorokin (1952–2013), Konstantin Lavronenko (1961), winner of the Best Actor award at the 2007 Cannes Film Festival, and Sergey Zhigunov (1963). Marion Gering, noted for his stage and film productions in the United States, was born in the city. Architects and artists of the city include Yevgeny Vuchetich, Seyran Khatlamajyan, Ashot Melkonian, Natalia Duritskaya, Martiros Saryan (1880–1972), Roman Chatov (1900–1987), Leonid Eberg (1882-1954), Lev Eberg (1907-1982). Scientists and explorers include, doctors N. Bogoraz and S. Fedosov, scientists Dmitri Mendeleev, A. S. Popov, I. P. Pavlov, George Sedov the Arctic Sea explorer, Yakov Frenkel (1894–1952) a solid-state physicist, Svyatoslav Fyodorov (1927–2000), ophthalmologist, Sabina Spielrein (1885–1942), psychoanalyst, Yuri Oganessian (a nuclear physicist who is the namesake of oganesson (element 118)). ^ a b c d e Энциклопедия Города России. Moscow: Большая Российская Энциклопедия. 2003. p. 380. ISBN 5-7107-7399-9. ^ "About the City". Official website of Rostov-on-Don (in Russian). Archived from the original on August 13, 2013. ^ "Районы города". Rostov-gorod.ru. April 28, 2008. Retrieved July 19, 2013. ^ "Rostov-on-Don. Jewish Family History Organisation. Accessed 19 July 2012". Jewishfamilyhistory.org. March 9, 2006. Retrieved July 19, 2013. ^ "World Map of Köppen−Geiger Climate Classification" (PDF). Retrieved July 19, 2013. ^ "Архив данных о погоде в Ростове-на-Дону. (in Russian)". Pogoda.ru.net. Retrieved July 19, 2013. ^ "Погода и Климат – Климат Ростова-на-Дону". ^ "Rostov–Na–Donu (Rostov–on–Don) Climate Normals 1961–1990". National Oceanic and Atmospheric Administration. Retrieved February 12, 2017. ^ "Взгляд". Vz.ru. Retrieved July 19, 2013. ^ "Rostov-on-Don: land of sunflowers and hi-tech hub. Russia Close up. RT.com. TV Novosti. Accessed July 20, 2012". Rt.com. June 19, 2009. Archived from the original on February 3, 2013. Retrieved July 19, 2013. ^ "Rostov-on-Don: Quiet Flows the Don Filatova, Irena. The Moscow Times. Accessed July 19, 2012". Themoscowtimes.com. Retrieved July 19, 2013. ^ "Tebodin website. Accessed July 20, 2012". Tebodin.com. Archived from the original on October 17, 2012. Retrieved July 19, 2013. ^ "Airport.com. Accessed 20 July 2012". Airport.airlines-inform.com. Retrieved July 19, 2013. ^ 1639. "Аэропорт Ростова-на-Дону. (Russian)". Aeroport-rostov.ru. Archived from the original on September 18, 2013. Retrieved July 19, 2013. ^ "Контакты авиакомпании. Accessed 29 June 2010. "Адрес: 344009, г. Ростов-на-Дону, пр. Шолохова, 272."". Aeroflot-don.ru. July 15, 2013. Retrieved July 19, 2013. ^ Grishchenko, Nikolay (March 27, 2017). "В Ростове аэропорт Платов построят к ЧМ-2018 раньше срока" (in Russian). Rossiyskaya Gazeta. Retrieved June 4, 2017. ^ "ROSTOV-ON-DON: Port's Details". Marinetraffic.com. Retrieved July 19, 2013. ^ "Rostov-on-Don shipping information. Marinetraffic.com. Accessed July 20, 2012". Marinetraffic.com. Retrieved July 19, 2013. ^ "Автоматизация телефонной связи". Computer-museum.ru. Retrieved July 19, 2013. ^ "Ростов-на-Дону перешёл на семизначную нумерацию городских телефонов". Sotovik.ru. November 30, 2004. Retrieved July 19, 2013. ^ Энциклопедия "Мой город", Ростов-на-Дону (in Russian). Mojgorod.ru. Retrieved July 19, 2013. ^ "Southern Federal University website. Accessed 20 July 2012". Sfedu.ru. December 20, 2000. Archived from the original on January 13, 2013. Retrieved July 19, 2013. ^ "Alliance Francaise". Archived from the original on May 7, 2006. Retrieved May 15, 2006. ^ "Бушнов Михаил Ильич на сайте". Kino-teatr.ru. Retrieved July 19, 2013. ^ "Ростовск��й цирк". Cirk.webrostov.ru. June 19, 2013. Archived from the original on February 6, 2009. Retrieved July 19, 2013. ^ "Ботанический сад РГУ". Rsu.ru. Archived from the original on February 22, 2014. Retrieved July 19, 2013. ^ "Synagogues and Jewish prayer houses of Rostov-on-Don". Jewishfamilyhistory.org. Retrieved July 19, 2013. ^ "Rostov-on-Don Diamond Way Buddhist Center of the Karma Kagyu Tradition (In Russian)". Rostov.buddhism.ru. Retrieved July 19, 2013. ^ "Отдел внешних связей, Официальный портал городской Думы и Администрации города. Ростов-на-Дону. Город Воинской Славы". Rostov-gorod.ru. Retrieved July 19, 2013. ^ List of Twin Towns in the Ruhr District. Twins2010.com. Accessed 28, October, 2009 Dead Link 19 July 2012 Archived copy at WebCite (November 28, 2009). ^ "Yerevan - Twin Towns & Sister Cities". Yerevan Municipality Official Website. © 2005—2013 www.yerevan.am. Retrieved November 4, 2013. ^ "Yerevan Municipality – Sister Cities. Yerevan.am. Accessed 22 June 2009". Yerevan.am. Archived from the original on October 2, 2011. Retrieved July 19, 2013. Законодательное Собрание Ростовской области. Закон №238-ЗС от 27 декабря 2004 г. «Об установлении границы и наделении статусом городского округа муниципального образования "Город Ростов-на-Дону"», в ред. Закона №153-ЗС от 28 ноября 2008 г «О внесении изменений в областные Законы "Об установлении границы и наделении статусом город��кого округа муниципального образования "Город Ростов-на-Дону", "Об установлении границ и наделении соответствующим статусом муниципального образования "Аксайский район" и муниципальных образований в его составе" и "Об административно-территориальном устройстве Ростовской области"». Вступил в силу 1 января 2005 г. Опубликован: "Наше время", №339, 29 декабря 2004 г. (Legislative Assembly of Rostov Oblast. Law #238-ZS of December 27, 2004 On Establishing the Border and Granting Urban Okrug Status to the Municipal Formation of the "City of Rostov-na-Donu", as amended by the Law #153-ZS of November 28, 2008 On Amending the Oblast Laws "On Establishing the Border and Granting Urban Okrug Status to the Municipal Formation of the "City of Rostov-na-Donu", "On Establishing the Borders and Granting an Appropriate Status to the Municipal Formation of "Aksaysky District" and to the Municipal Formations It Comprises", and "On the Administrative-Territorial Structure of Rostov Oblast". Effective as of January 1, 2005.). Ростовская-на-Дону городская Дума. Решение №267 от 3 декабря 1996 г. «Об утверждении положения "О символах г. Ростова-на-Дону"», в ред. Решения №507 от 13 августа 2013 г «О внесении изменений в Решение Ростовской-на-Дону городской Думы "Об утверждении Положения "О символах г. Ростова-на-Дону"». Вступил в силу 31 декабря 1996 г. Опубликован: "Ростов Официальный", №51���52, 1996. (Rostov-on-Don City Duma. Decision #267 of December 3, 1996 On Adopting the Provision "On the Symbols of the City of Rostov-on-Don", as amended by the Decision #507 of August 13, 2013 On Amending the Decision of the Rostov-on-Don City Duma "On Adopting the Provision "On the Symbols of the City of Rostov-on-Don". Effective as of December 31, 1996. ).